We are running two homes for abandoned children, one for girls and one for boys. The children and youths are provided with food, shelter and get the opportunity to go to the nearest schools. Wherever possible, we try to reintegrate the children with their families. IRCDS has been entrusted by the Government to manage these homes as part of a programme aiming at upholding the rights of children under the Juvenile Justice Act, 2000. The boys home is situated in Ekkadu and shelters around 40 children. The girls home is situated right next to our office in Tiruvallur and shelters around 20 children. 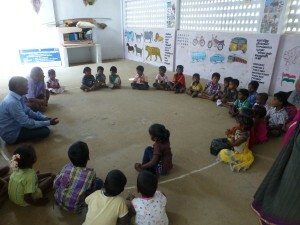 Since June 2012, the District Child Welfare Committee is working in our premises. The Committee provides counselling, care and protection to children who have been rescued from child labour, abuse and any other form of maltreatment. The aim is to make it possible for the children to reintegrate their families. If this is not possible, the rescued children are temporarily placed in our Reception Unit until a permanent solution is found. We are managing this Unit with the support of Directorate of Social Defence under the Juvenile Justice Act 2000. For more information on the Juvenile Justice Act 2000 and the role of the Child Welfare Committee, visit the website of the child line. Tiruvallur District is one of the main suppliers of bricks for Chennai city. 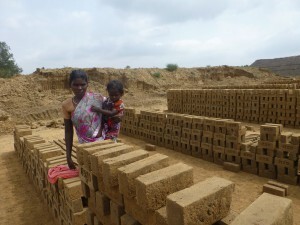 Brick kiln workers migrate to Tiruvallur District from other districts of Tamil Nadu and even from other states such as Orissa and Andra Pradesh to work here from January to July. For the children, the consequences of seasonal migration are drastic when it comes to schooling. Since the continuity of schooling cannot be guaranteed, they often drop out of school very early. To solve this problem, we are working with 2,250 children of seasonal migrant labourers in 350 brick kilns and cooperate with 42 Government schools and 71 anganwadi centres in Tiruvallur and Kancheepuram districts. We rise awareness on the importance of education among the children, their parents, their parents’ employers, in the schools and in community-based-organisations. Moreover, we do advocacy of mainstreaming children in regular Government schools with the SSA. We are also conducting trainings about labour rights and the Right to Education Act 2009 in the source districts. Our aims are that children between 3 and 5 years old are provided with nutritious food an receive pre-primary education in their parents’ work places and that the children between 6 and 14 study in schools in both source- and destination districts. As a result of our fruitful cooperation with the District Administration, the Education Department (SSA) and the District Child Protection Unit the school enrolment of migrant children has increased to 87 %. At the level of the Anganwadis, 55% of the migrant children are enrolled. Find a video about our Summer Camps 2015 above. To rise awareness on the importance of education among children, we organise Summer Camps during which children can get a taste of schooling through playful learning activities. The camps have shown to have a great positive impact on migrant children’s education which is why we aim their integration into the annual action plan of SSA. Most of the children of migrant brick kiln families are first generation school goers. Some of the students do not pursue higher education in spite of their good grades for two reasons: they cannot afford it and do not receive proper guidance. Together with an ILP volunteers groups, we are filling the financial and social gaps by providing scholarship- and mentoring support. In 2016, we are supporting 32 students to complete the following degrees: MBBS, B.E, B.Sc., BA, M.Sc, DTED, BCA, Nursing and Diploma in Engineering. Copyright © 2019 IRCDS. Powered by WordPress. Theme: Spacious by ThemeGrill.